statistically speaking it's already written! At the world scale, it is estimated that 70 % of all mergers and acquisitions fail to fulfill their purpose! And the purpose is generally about… making more money. 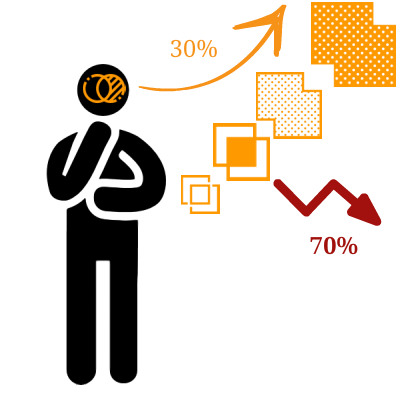 70% is the optimistic version, a more pessimistic one is about 90%, according to Harvard Business Review report. Said in another way, you have between 7 to 9 chances out of 10 to make one of your most costly business decision in your professional life. You can prevent yourself from mistakes by hiring the most expensive law firm on the planet. There are a few ones. I even had friends working in some of them. That’s the number one solution that most business leaders go for. And that’s not the one you really need!!! Think about it, if companies from the Fortune 500, with unlimited resources – compared to regular small-medium companies- failed, then what are the chances you fail? A lot of companies – because it’s trendy- say that their people are their most valuable asset and it’s true. BUT… they don’t really care about their people during the merger/acquisition process. Keep in mind this: according to a study from AON/HEWETT, there is a 23% increase in “actively disengaged employees” after a change event – even if no one’s job is affected and it takes about three years to return to pre-merger engagement levels. So, I'm not a lawyer and don’t have all the answers and solutions to mergers & acquisitions issues. my human capital expertise will prevent you from costly mistakes. Improve your merger / acquisition success chances today! Some statistics talk about 17,2% of actively disengaged employees on average in any company, and it costs $3,400 for every $10,000 of salary (34 percent) to the company every year. So if we got a 23% increase of “actively disengaged employees”, then it makes roughly more than 1/5 of your employees that are actively disengaged, and it costs to your company 34% of the salary of these people. So if your acquisition or merger impacts 1000 people, with an average salary of 30 000 USD. Then the actively disengaged employees will cost you 2 157 912 USD, just the first year! If you agree with “our people are our most valuable asset”, then you understand that financial ratios are not enough to really map out the opportunities and threats that a merger or an acquisition represents. Value generation inside an organization is fundamentally a human matter. Of course, software, machines, processes, investments are important, needed BUT let’s remember that they are designed, developed by people - and should be for people, with the goal to generate value. However, their used or misused, their adoption or rejection are subjected to people’s perception of their value. As soon as you understand that, you understand that merging with or acquiring another company is going to involve a lot of different value perceptions from all the people involved. If someone is involved, then this person matters. Usually, mergers and acquisitions involved all the employees. Then they all matter. Expecting people will simply “follow the flow” and adjust by themselves to please somebody’s decision is a grave misunderstanding of human’s nature.